If you ever wondered which is the most expensive hotel in the World. Well here is the answer, The 2nd most expensive hotel in World is one located in the Abu Dhabi, UAE. The hotel’s name is: The Emirates Palace Hotel. The Hotel was Built as a landmark showcasing Arabian culture, luxurious hospitality. It is Situated on 1.3 km of private beach and surrounded by 85 hectares of gardens and lawns, with 114 domes that are 80 meters high. 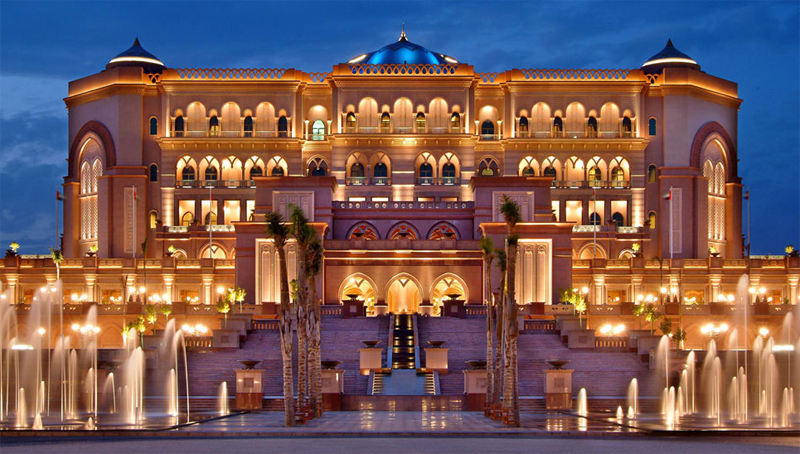 The Emirates Palace comprises 394 rooms and suites. Now the question is What this hotel offers and how much is the living cost? The costs to build the hotel were US 3 billion. That makes The Emirates Palace the most expensive hotel on earth ever built until surpassed by Marina Bay Sands in Singapore, opened in 2011. The Emirates Palace was opened in March 2005 but certain restaurants and facilities did not open until 2006. The hotel was built by and is owned by the Abu Dhabi government, and managed by the Kempinski Group. The Emirates Palace offers variety of luxury amenities to satisfy guest’s all needs, whether you come on holiday with family or a business meeting or visiting to participate in an international conference. The hotel has 302 rooms and 92 suites spread over two wings and a main central building. Many of the suites offered are furnished in gold and marble. The main central building houses an expansive marble floor and a large patterned dome above. It is adorned with gold horns, gold chandeliers and golden finials on its rooftop domes along with 1002 Swarovski crystal chandeliers. The top most floor has six Royals Suites which are reserved solely for royalty and dignitaries. The hotel also contains a large conference center with an auditorium capacity of 1100, in addition to over 40 meeting rooms and six large terraces. The Beach Club boasts a six-kilometer cycling/jogging path, two outdoor pools, water-sports, tennis courts, cricket, a rugby pitch and soccer facilities. With your stay you can enjoy not only the decoration but also the 12 restaurants and about a mile of private beach. The rates for overnight stay in modest rooms begin at $ 773. Moreover, the Palace suite has a living room, dining room and three bedrooms with a touch screen remote control room to $ 11,200.00 per night. Now, below are the some photos of the hotel for those who still can not give themselves the opportunity to see this in person.